1) Military airspace is not that big a factor in NYC area or BOS-WASH corridor travel, which is where the worst of the delays originate. The FAA has a great little website, here, which shows you the status of "special use airspace" (including military space) pretty much in real time. Here is how it looked mid-afternoon Friday EST last week -- a busy travel time! It's not worth explaining all the details here, but the main point is: there aren't that many "special use" areas near the big East Coast airports. If New York City were where Camp Lejeune is, in North Carolina, then military airspace might be an issue. * But, umm, it's not. 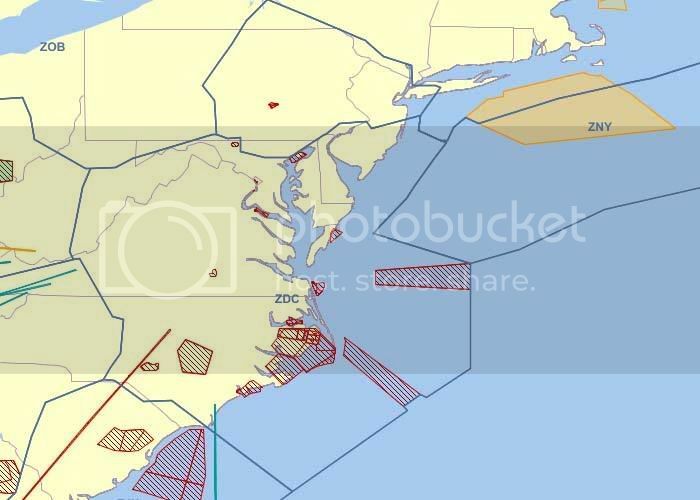 The NY-area special airspace that looks biggest -- the brown thing off Long Island, which says ZNY (meaning that its airspace is controlled by "New York Center") -- is a "warning area," which differs from those off-limits to airliners and is way out over the ocean anyway. The military airspace referred to -- according to the controllers that work it -- has always been opened to civilian traffic during the holidays. If there is a thunderstorm (not likely in late November) over the land routes the airspace will come in handy. Otherwise, the only thing it will be good for is extra holding patterns. 3) The plan does nothing at all about the fundamental source of most airline delays: that big hub airports simply don't have enough runways for all the flights the airlines would like to schedule for busy times. Don Brown's comparison is right: it's like thinking you'll be able to fit 300 cars into a 200-space parking lot if you open an additional entrance ramp. (More explanation from Brown here.) The only solutions to this challenge are long term: either more runways at LaGuardia, O'Hare, JFK, et cetera, or more use of the 4,000 small airports in America that now are lightly trafficked. Or more travel by other means. Or less travel. Bonus point # 4): I must really have been away for a while, because I truly was taken aback by this FoxNews video announcing the plan (via Ezra Klein). Unexpectedly to Fox, the guest they had on to comment pointed out that the plan wouldn't do any good. But until they got to him, the hosts again and again personalized the wonderful gift The President had given the American public, and how "Thankful Travelers" would benefit from his wisdom. Jeesh!